For a journalist, meeting the cast of the Workshop Players’ forthcoming production of ‘Evita’ can be an intimidating business. One is faced not just with one, but four Evas and three Ches and two Perons besides. Do you blame me for saying ‘No, thank you,’ to meeting the Magaldis? Perhaps you should – after all here was the man who brought Eva Duarte to Buenos Aires. As far as our musical is concerned, there is really only one man of significance after Agustin Magaldi – Juan Peron. The latter was a military man and a fan of Hitler and Mussolini, the former, a musician was nicknamed ‘The sentimental voice of Buenos Aires’. All they had in common was that they had both known Eva. Yet, for all that there was no denying her extraordinary charisma, they could never quite agree about her. She died young but not young enough for us to forget her many sins. In the years since, the surging crowd below the balcony has only grown more cynical, but we have not shed that yearning for beauty and for goodness or the romantic hope that both were embodied in Eva Peron. For the Workshop Players, the sprawling musical is both a challenge and a delight. As opening night (October 5) draws closer, the cast have begun to polish their performances, layering nuance upon nuance and ironing out the logistics of costume changes and stage entrances. In their final interview before Evita goes on the boards at the Lionel Wendt for a ten-day run, they talk to the Sunday Times about what the production has taught them about Eva Peron and about what they’re capable of as performers. The Evitas have been accused of forming an exclusive “coven” during rehearsals, but they seem entirely unapologetic. They’re so in sync that they complete each other’s sentences. Speaking of how mastering the dance sequences have been a challenge, Dilrukshi Fonseka says: “It’s nice to see people who walked in with two left feet” “Now only have one and half,” finishes Shanuki de Alwis. Also on the Evita roster are Melanie Bibile and Dmitri Gunatilake..
They’re also unabashed in their appreciation for each other: Shanuki is the story teller, with the experience to effortlessly claim the spotlight. Dilrukshi has a natural stillness and gives Evita’s last moments a searing poignancy. Dimitri is all youth and sensuality (“With her you can draw parallels to Marilyn Monroe,” is Shanuki’s verdict) and Melanie’s potent, stylish performance will take you by surprise. Playing Evita is a two and half hour sing-a-thon – with 16 costume changes thrown in for kicks. For Melanie, it’s been about hitting the right notes. As an alto, she sometimes feels like she’s trying to master music written for a soprano – “My challenge was to sort my voice out,” she says. For Dimitri, the “baby” in the group, the real test is of her acting skills. Could she age along with Evita? Sometimes this process is so accelerated that the character adds a decade to her life in a single song. The others chime in that the transformation is equally emotional and social – the difference between a 15-year-old country girl in a bar and a representative of her country on an international goodwill tour. 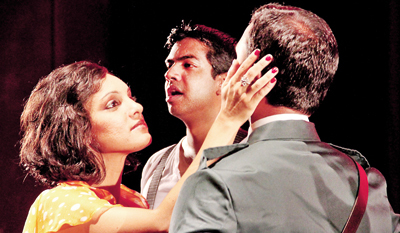 Dilrukshi sees Evita as a character beset on all sides. “Eva is the only one fighting for herself. Personality traits that are admired in a man are the first things to be slandered when you are a woman,” says Dilrukshi, in response to a question about whether she sees any misogyny in the script. “This is the 1930s after all – any hint of ambition or sheer determination and the labels start rolling easily off the tongue.” Shanuki is clear that “we don’t expect the audience to like the character of Eva.” However, there are moments where you see past the facade to the little girl that’s still there, says Dilrukshi, and for her it is these hints of vulnerability that make Evita such an interesting character. “At one level she wants to be truly, genuinely loved by the people.” That she succeeds in that is undeniable. “That she had nothing, and she grows up to be somebody who was respected by a lot of people, you have to admire that,” says Melanie. No one really pays attention to Juan Peron. Mario de Soyza certainly didn’t. In fact, he didn’t even want to play Per0n – Che seemed the meatier role. Mario has since had a change of heart. “We’ve both found that there is a lot more content in playing Peron than there would have been in playing Che,” he says, speaking for Eraj de Silva as well. Eraj nods in agreement. “This role is tough because it demands a lot of subtle acting – it’s not flamboyant or glamorous,” he says, explaining that he believes it is that very attribute of being restrained that sets off the other roles so well. In the Evita universe, Peron is something of a pushover. He’s always second guessing himself, and for Eraj, Eva’s gift is her ability to assuage Peron’s many doubts. “In the script it’s not really clear who is exploiting who,” says Eraj, but he’s enjoying how playing alongside different actresses in the role of Evita subtly alters his own performance. Where Mario’s approach appears to be more cerebral, Eraj’s is instinctual. Mario says his own portrayal is evolving because of what he sees in his friend’s performance: “It’s in the small things – how he holds her hand; when she says ‘you must love me’ whether he drops his head or looks up at her.” For both of them, it’s about finding the right balance of offering a unique performance yet embodying the same man night after night. His very fluidity means that “Che doesn’t exist,” says Shenoj de Alwis, who thoroughly enjoys exchanging ‘venom’ with his sister Shanuki. Not being able to really interact with any of the other actors on stage is offset somewhat by being the only character to actively engage with the audience, says Shenoj. Keith de Silva, is their understudy and he points out that the beginning of the musical is also its ending. Yet, Che does have a character arc of his own. There are “glimmers”, moments when he seems to give in to hope. Joining the crowd’s euphoria, he chants “Peron! Peron!” with the rest of them. It’s why the actors find it useful to play it scene by scene. The highlight for Rehan might be the moment “where he becomes a real person in Eva’s mind”. The charged waltz is the ground for their debate and the audience is left with the suspicion that no one on stage is telling the whole truth, including Che. In the end, the camaraderie is something they enjoy most about performing with The Workshop Players. “Here we really are a family. Workshop is built on its ensemble, on its chorus line,” says Shenoj. Published in the Sunday Times, Sri Lanka on September 30, 2012. Words by Smriti Daniel. Pix by Andre Perera, Pierre Samarasinghe and Indika Handuwala. Tags: A young cast looks forward to a challenging production of Evita in Colombo. Bookmark the permalink.